The Allen Co's Gunnison Switch Pack easily converts from a daypack to a left- or right-side sling pack. The main compartment has a full-length zipper that can be accessed from both sides. The vertical interior storage pockets can also be opened on either side, and they are great for both boxes and gear. The Allen Co &apos;s Gunnison Switch Pack easily converts from a daypack to a left- or right-side sling pack. The main compartment has a full-length zipper that can be accessed from both sides. The vertical interior storage pockets can also be opened on either side, and they are great for both boxes and gear. 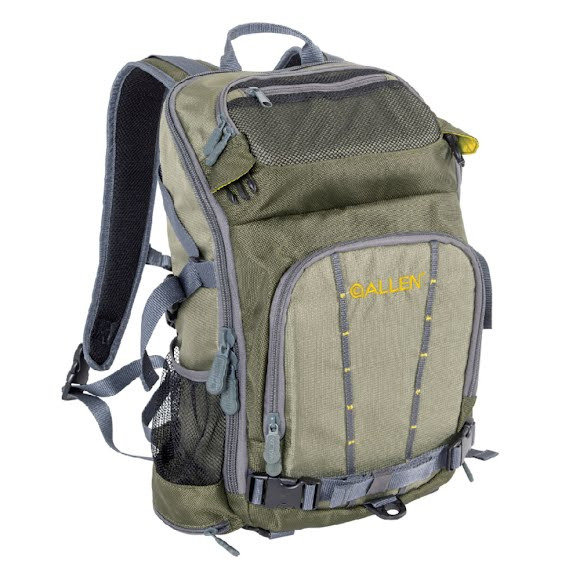 This pack also features multiple rod tube/water bottle carrier pockets, front and rear buckles for attaching Allen chest packs, heavy-duty molded zippers, a hydration pocket, and water resistant interior pockets for your keys, cell phone, or camera. Includes adjustable straps for your rain jacket or waders. Measurements 18.5" x 12" x 2.25"